Pierate - Pie Reviews: Watching Pierateers in Panto? Oh yes we are!!! You’d think that with so many exciting adventures aboard the Pierate Ship at present there would hardly be time for any more hot off the press news, but anyone who read our 4th Birthday celebration article will know that there sure is! 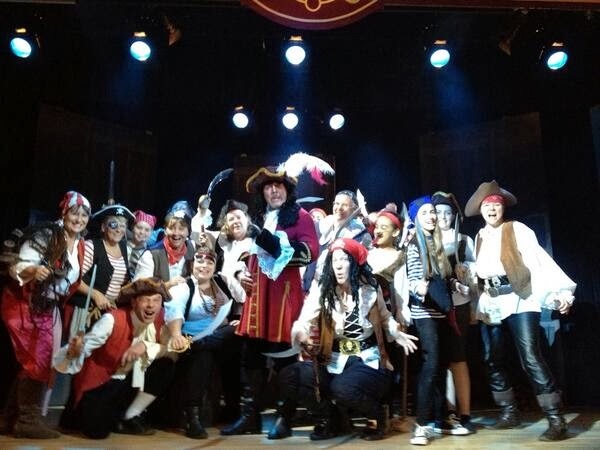 For we can now officially announce that www.pierate.co.uk are the official programme sponsors of The Woodfield Entertainers 2013 pantomime “Captain Hook’s Revenge”, being performed from Thursday 12th to Saturday 14th December 2013. Pirates of the Caribbean Ashtead, Surrey! For those who haven’t guessed yet, there aarrrrrghhh plenty of pirates in Captain Hook’s Revenge, however after being approached by the local group based in Ashtead (Surrey) about our interest in sponsoring the programme, they kindly suggested that they might well have some Pierateers on board as well by slightly adapting the performance to ensure some yummy pies are eaten by the pirates in question and a cheeky little reference to Pierate – the web’s leading pie review blog – is made! For further info, do check out The Woodfield Entertainers website and @Woodies12 twitter feed.